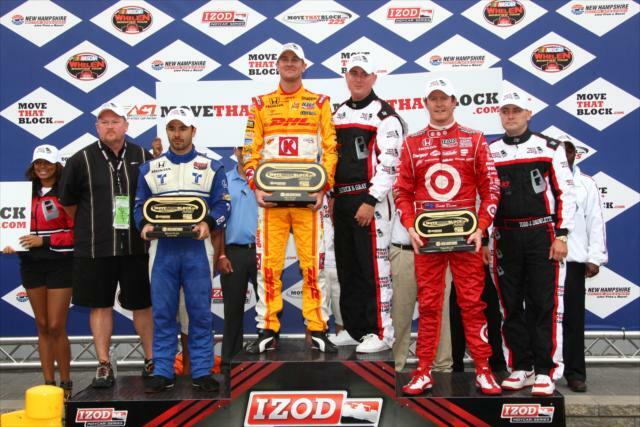 The IZOD INDYCAR Series' return to the 1.02 New Hampshire Motor Speedway oval succeeded in producing a memorable event. After 115 laps, the MoveThatBlock.com 225 race ended with the #28 Andretti Autosport car driven by Ryan Hunter-Reay presiding in victory lane. However, as the Florida native celebrated his first win since the 2010 Long Beach event, the result was marred by a subjective ruling by the IZOD INDYCAR Series race control. Attempting to end the race with one final green flag run for the MoveThatBlock.com 225, damp weather conditions caused many drivers a sense of distress. Several competitors such as Will Power and James Hinchcliffe were livid in the cockpit as droplets of water were filling their visors and coating the New Hampshire Motor Speedway pavement. Against the wishes of what would be revealed to be many open wheel drivers, the green flag flew on lap 215. As Firestone racing slick tires struggle for grip, race drivers were brought to mercy of the very little traction remaining on the surface. Immediately on this double-file restart, the #7 car of Danica Patrick spun out of turn 4 coming to green collecting Takuma Sato's #5 KV Racing Technology vehicle as well as the #12 of championship contender Will Power. For some, the driver's anger was summed up in the actions of an infuriated Power. Jumping out of his Verizon Penske Racing Dallara, the Australian driver displayed obscenities with both hands directed towards INDYCAR Race Control. With those wrecked vehicles demoted in positions on the unsuccessful restart, the lead of the race was claimed by Newman/Haas Racing driver Oriol Servia. Appearing as if the Newman/Haas driver would take the New Hampshire victory, INDYCAR effectively cancelled the existence of the race's final 10 laps and the chaotic restart. The reset returned Andretti Autosport's Ryan Hunter-Reay to the top of the race lineup for lap 215. Throwing a red flag on the field following the last restart, INDYCAR chose to immediately call the race 10 laps ahead of the 225-lap distance. Slapping a tentative tag on the race results, the New Hampshire event ended with some teams and drivers instantly expressing their displeasure for INDYCAR's decision to revert the field back to their positions prior to the restart crash. Target Chip Ganassi Racing and Newman/Haas Racing filed official protests against the race results of the MoveThatBlock.com INDY 225 within 30 minutes since the checkered flag fell on the controversial finish. Disputing that the race result ruling goes contrary to series rules, both teams had significant gains on the final restart deleted. For Newman/Haas Racing, their #2 car was guided to a certain victory at New Hampshire Motor Speedway through Oriol Servia's jump position in the lead ahead of the red flag. Through the reverted finishing order which is currently unofficial, Servia comes 2nd in the event with teammate James Hinchcliffe taking 4th. Target Chip Ganassi Racing had a difficult MoveThatBlock.com 225 even as the #9 car of Scott Dixon claimed a 3rd place finish. The major heartbreak for the team resulted with their #10 car retired on lap 118 after a collision with Takuma Sato on a race restart. The #10 car driven by Dario Franchitti suffered a rare DNF result and opened the door for the driver championship rival Will Power to gain significantly on the day. Running 5th on the final restart, that championship challenger Power was along those caught in the frontstretch wreck greatly erasing the potential points gain on Franchitti. Able to hold on to a top-5 finish, Will Power close 15 points on Dario Franchitti in the overall 2011 IZOD INDYCAR Series championship. Scheduled to take place during last week (August 22-26), a hearing will be assembled byINDYCAR president of competition and operations Brian Barnhart. Criticized for his role in Race Control Sunday for electing to green flag the field for the notorious restart, Barnhart emphasizes the hearing will involve a panel of selected individuals. "Given my role in Race Control, I feel that it is in everyone's best interest to have an independent panel hear the protests. I believe a panel will help maintain a fair hearing." said Barnhart. Hearing panel judges have not been chosen by this name but should be decided soon. Although Andretti Autosport was not part of the official protest (despite losing a vehicle on the poorly-conceived restart), the #28 team representatives will be present at the upcoming hearing. The Andretti Autosport #28 team's victory grants the organization interest in the overall outcome of the official INDYCAR ruling for the New Hampshire Motor Speedway event. Intent to overturn the current result of the New Hampshire Motor Speedway event, Target Chip Ganassi Racing and Newman/Haas Racing are likely to be fighting an uphill battle. In the current series' 15-year history, a race victory has never been altered through post-race hearings.